A view of The Bund near the corner of Nanjing Road in Shanghai, China. Shanghai is a large and lively city. I’ve visited and photographed Shanghai twice over the years. The first time was way back in 1995 when I combined a business trip to China with my own photography adventures. I was working for Kodak back then and presented lecturers in Beijing, Shanghai and Chengdu. A view towards the famous Oriental Pearl Tower, through a gap in the Monument to the People's Heroes, from The Bund in Shanghai, China. Back then I was using Kodak Ektacolor Gold 160 and, occasionally, 400 film. To achieve better shadow detail and more saturated color I’d rate those films at an Exposure Index of EI 80 and EI 200 respectively. If your ever find yourself experimenting with a roll of color negative/print film I’d recommend the same approach. And don’t worry, there’s no need to have the film developed any differently. A view of Pudong from across the Huangpu River on The Bund in Shanghai, China. 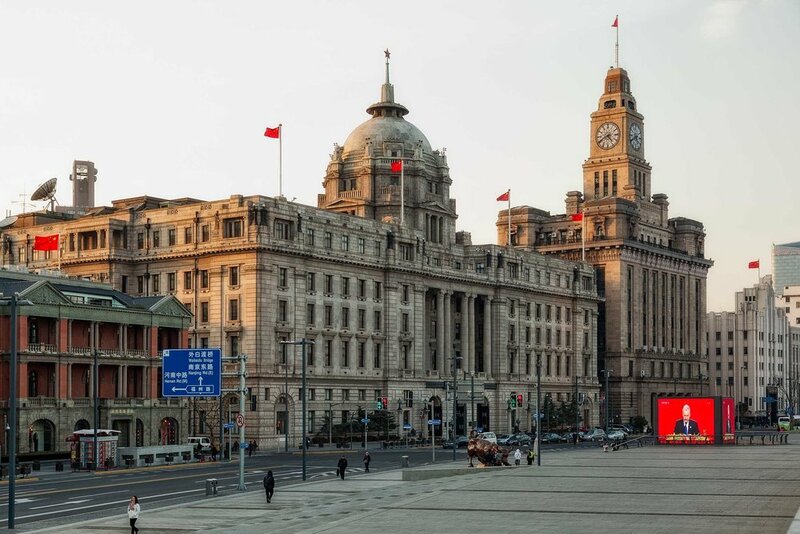 The Bund is a great location to explore and to photograph. 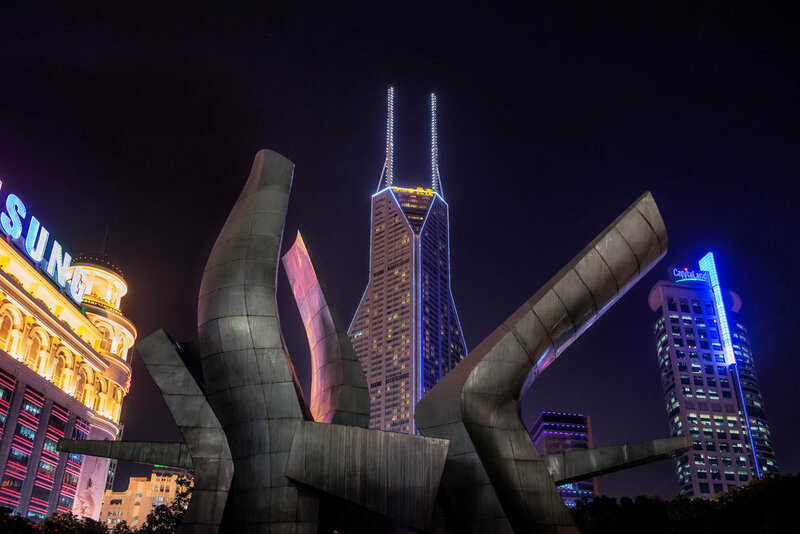 Perhaps the best time for a photography session at the Bund is either side of sunset as you look across the Huangpu River to the futuristic Oriental Pearl Tower, a really photogenic scene at that time of day. 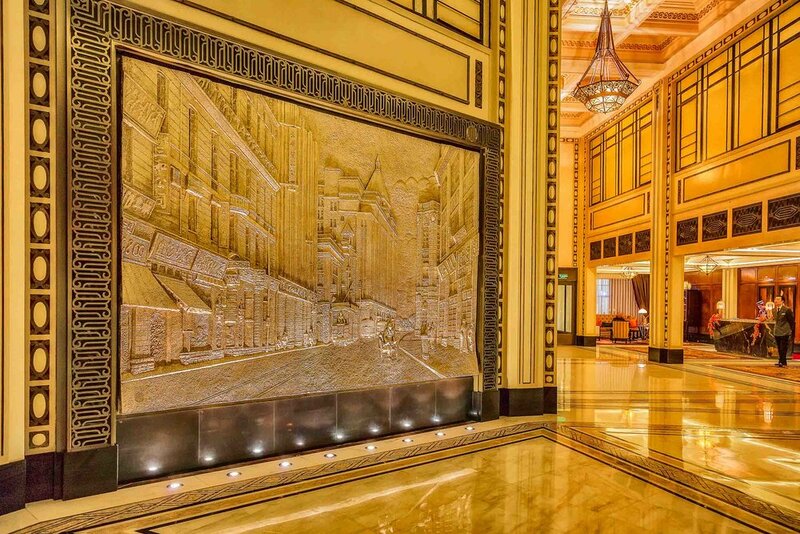 A fabulously detailed mural in the lobby of the Fairmont Peace Hotel in Shanghai, China. Near the north end of the bund you’ll find the Monument to the People’s Heroes and, just across the road from that, the lovely Fairmont Peace Hotel. If you’re looking for a great meal or for a nice quiet drink in historic surroundings then I’d recommend the lovely Fairmont Peace Hotel. On my last visit to Shanghai I treated myself to a fabulous meal in one of the Peace Hotel’s restaurants. I was very happy to score a table with a view over the Huangpu River directly onto the Oriental Pearl TV tower. Some of the members of the famous Old Jazz Band in the Jazz Bar at the Fairmont Peace Hotel in Shanghai, China. My main reason for visiting the Peace Hotel was to check out the famous Jazz Bar, which I first saw back in 1995. The band has played in the Jazz Bar, in one form or another, for decades. It must have been an incredible place back in the 1930’s when Shanghai was known as the Paris of the East and, interestingly, the New York of the West. I reckon those guys have seen it all and I loved my time listening to classic jazz tunes in such a nostalgic environment before venturing out into the glitz and glamour of Nanjing Road. I’d head back there tomorrow if I could. Nanjing Road is a shopping mecca for many, and a great location for night photography. It’s a very busy street, even at night, and at 5.5 km (i.e., 3.4 miles) in length you’ll need to set quite a bit of time aside to see it all. The good news is that, as well as all the glitz and glamour you’ll see along Nanjing Road, it’s a pedestrian friendly street so you’ll find plenty of opportunities for great architectural and people photography while you’re there. Graphic architecture and skyscrapers at night along Nanjing Road in Shanghai, China. Of course night photography is not without its challenges. You need to be able to find and operate those dials and buttons on your camera in the dark and, when it comes to architectural photography, you need to be able to keep your camera still so as to eliminate camera shake. The good news is that, with brightly illuminated shops on either side of the street, there’s quite a bit of light around to make pretty decent night photos without the use of a tripod. Frankly, with the thousands of people wondering up and down Nanjing Road you’ll find carrying and using a tripod to be quite a difficult experience. Traffic lights and buldings along Nanjing Road in Shanghai, China. Get used to holding your camera still at relatively slow shutter speeds and, where appropriate, increasing your camera’s sensitivity to light by photographing at a higher than normal ISO. Just keep an eye on the ISO as there’s the inevitable trade off between very high ISO and noise. However, at the end of the day, you’re going to be better off with a sharp photo that displays some noise than a blurred photo that doesn’t. Night along Nanjing Road, looking back towards the Oriental Pearl Tower in Shanghai, China. Can you see the strange appearance of the street light in the top left of the above photo. Notice how over saturated that colored light appears and how it seems to burst out from the light source. In photography this phenomenon is referred to as blooming. Perhaps, at this stage, it’s worth taking a moment to explain this concept. The imaging sensor on your camera consists of an array of photovoltaic cells that convert light into an electrical charge. The charge reaching individual pixels is mapped as a number, depending upon the amount of brightness they receive. Blooming happens when an overly large amount of light is focused at a particular point on your camera’s imaging sensor. This can create so much charge that it actually bleeds from pixel to pixel and spreads out as a blob of light and/color. There might be images you make where, for purely aesthetic reasons, this effect works by adding to the creativity in your image. However, more often than not it’s a problem as it draws viewer’s attention away from the major subject or focal points in your image. There are some technical approaches you can take, both in camera and on the desktop, which may reduce the problem. The best thing you can do is to exclude such a bright light source from your composition or, alternatively, change the angle from which you’re making your photo so that the light source in question isn’t shinning so directly into your camera’s lens. Sometimes, just by turning your camera ever so slightly away from the light is all you’ll need for a more acceptable result. Depending upon the situation and the desired outcome blooming and flare can either make or spoil an image. If you find you simply can’t make the image without flare then perhaps the best thing to do is to try and compose your photo so that the flare adds to the emotional impact of your image.